Eumelia, which means harmony, is a unique sustainable development agrotourism and ecotourism accommodation. Eumelia host yoga retreats, organic and weddings as well as workshops and events for wellbeing. Wine, olive oil makers, wine and olive oil tastings, cooking classes with organic farm to table gastronomy. Olive picking and grape harvest and other agricultural activities. Eumelia’s organic farm is designed along the principles of homeodynamic / biodynamic / permaculture and the accommodation facilities are created using entirely eco-friendly materials and technology, such as recycling, compost, geothermic heating / cooling, and water recycling. Located in the prefecture of Laconia near the village of Gouves, we welcome visitors from Greece and around the world to visit Eumelia throughout the year. Welcome farm to table dinner. The chef will prepare for you an organic and zero kilometer meal. Eumelia’s organic vegetables are combined with local delicacies and form a unique gastronomic experience. Sustainability tour of the organic farm and guesthouse, learn and come in contact with the Greek agricultural landscape. The aim and wish is to establish a sustainable example of an ecotourism / agrotourism / education / culture space that receives, entertains and educates visitors as well as the local population on issues such as environment, environmental technology, organic farming methods, alternative health, sustainability, self-sustainability and progressive educational tools. 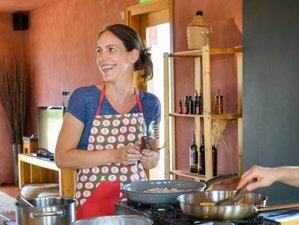 Local cuisine cooking class with a twist and lunch: Learn all the secrets of the local Laconic gastronomy with the guidance of the farm chef. Prepare and bake your own sourdough bread made with locally sourced and milled organic flour. Pick fresh eatable wild greens from the farm and learn to prepare filo dough and make that famous local pitas. Pick the vegetables and herbs you need from Eumelia’s organic gardens and herb spiral and prepare your own local cuisine traditional meals with a twist. From farm to your table, prepare and cook an organic, traditional, local cuisine and zero kilometer meal. The organic vegetables and the famous organic olive oil are combined with local delicacies to offer you a unique gastronomic experience. Put together the gastronomic puzzle of the region, boil, bake and create special dishes from the symphony of local products. Basic Greek culinary language class: Learn basic culinary Greek and know your way around a Greek kitchen, when you order your food at a taverna or shopping for food in a local market. Head to the seaside Byzantine Castletown of Monemvasia. Liqueur tasting, local fermented honey and other local specialties tasting with a view of the sea and surrounded by Byzantine architecture. Begin your second daily visit of the region and this time you head to the historic area of Mani, filled with small stone castles and a raged terrain unmatched in beauty. You will visit the historic towns of Gytheio and Areopolis and head to the seaside town of Limeni with its theatrical backstage landscape and architecture. You will see how the local delicacy “Pasteli” (a honey sesame bar) is created and taste a freshly baked variety. Enjoy lunch by the seaside in one of the most amazing locations and enjoy fresh seafood in the town of Limeni. Head back to Gytheio for an afternoon drink with a background stage of neoclassical buildings and the picturesque port. Olive oil and olive tasting. Learn all the secrets of the green gold of Greece, how to distinguish a fresh extra virgin olive oil, the eatable Greek olive varieties and how to store your olive oil properly. Meet the perennial olive trees that age more than 2000 years - you can even hide in their trunks! Visit Ancient Sparta and have a guided tour by an archeologist of the city state that inspired millennia of history. Visit one of the nine olive oil museums in the world and see the history and tools used throughout the centuries to produce the liquid gold. Lunch at one of most unique tavernas in Laconia. Laconia is a diverse destination in the Peloponnese in southern Greece that includes a vast range of ancient sites, culture, historical monuments, museums, beaches, and picturesque villages on the mountains or by the sea side. The Laconic Gulf between the two mountain ranges of Taygetos and Parnonas provide the area with an amazing variety of experiences from local cuisine, architecture, nature, scenery with alternating horizons and backgrounds. There are a number of activities that you can enjoy in this magnificent part of the world, cave exploration in Diros, visit a petrified forest in Cape Maleas, go to the end of the world as it was known in ancient Greece in Cape Taineron and the southernmost tip of the Balkan peninsula. Surf, scuba dive, mountain bike, hike up on the mountain ranges of Taygetos & Parnonas, visit the ancient port of Sparta near Gytheio, walk around the medieval castle town of Monemvasia. Walk along the monasteries and churches in Mystras home to the last Byzantine Emperor, experience the rugged beauty of the stone home fortresses of the Mani region. Walk around the delta of the river of Evrotas, a Natura protected natural habitat. Live in ancient Sparta, feel the mighty strength of this ancient Greek state. This holiday includes Greek slow food culinary and gastronomic experience, 3 meals per day (organic breakfast made from Eumelia’s organic products, lunch, and dinner). They take great care and choose carefully the taverns and restaurants based on their atmosphere and quality of the local and regional cuisine. All meals after breakfast include wine. The closest airport is Kalamata International Airport. Transfers are provided for 150 EUR each way. Transfers from and to Athens International Airport are 300 EUR one way or 500 EUR both ways. When you reach the village on your left hand side you will see a church in a corner, make a left turn there and follow the sign posts to the farm. You can take the bus to Vlachiotis town bus station. From there, it is a 15-minute taxi ride to Eumelia. Airport: Kalamata International Airport Airport transfer available: Kalamata International Airport (US$169 per person) Additional charges may apply. You can request this in the next step. Airport: Athens International Airport Airport transfer available: Athens International Airport (US$338 per person) Additional charges may apply. You can request this in the next step.